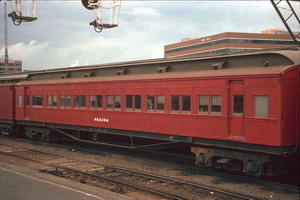 V&SAR Joint stock wooden sleeping car Pekina was built at the Victorian Railways Newport Workshops for use on The Overland. See also V&SAR sleeping cars: Acheron, Angas, Baderloo, Barwon, Coliban, Dargo, Finniss, Glenelg, Inman, Loddon, Onkaparinga, Tambo, Torrens. 27.6.1969 South Australian Railway equity brought by Victorian Railways. 15.9.1969 Altered to "Sleeping car No. 9". 6.1986 Being used on the "Train of Knowledge". Fitted with 4 wheel roller bearing bogies. 1990 Withdrawn and allocated to AREA. 1997-98 Allocated to Syemour Rail Heritage Centre. 2017 Reallocated to "The Overland Museum". 17.6.2017 Moved from "Seymour to Newport". 6.12.2016 Moved to "Overland Museum" Kaniva by road.